Gary Bettman concedes the Phoenix Coyotes have problems, but the NHL Commissioner says the franchise is going nowhere -- and that the League hopes to have the team's problems solved by season's end. Speaking via telephone to FSN Arizona announcers Dave Strader and Darren Pang during the first intermission of the Coyotes game against the Red Wings in Detroit, Bettman reiterated comments he made during All-Star Weekend that the Coyotes aren't going anywhere -- though there may be new investors coming in. "There's been a tremendous amount of speculation and commentary about the state of the Coyotes," he said. "I think most of it has been terribly unfair to the Coyotes organization, to the players, and, most important, to the fans. There are some issues we're working on in terms of getting a new capital infusion for the club, which will probably take the form of some new partners for (majority investor) Jerry Moyes, or even a possible sale of the franchise. But these reports of the franchise's demise are just ridiculous." 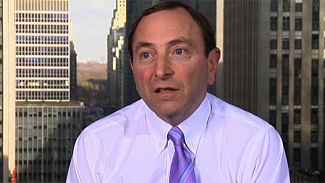 Bettman said the NHL has had talks with a number of potential investors. "The fact is, there are lots and lots of interested parties as it relates to the Coyotes' situation, and we're in touch with all of them," he said. "I think anybody who has a business interest in the future of the Coyotes as far as an ownership level, or the city of Glendale (where Jobing.com Arena is located), or business partners -- we're in touch with the people we need to be in touch with." Moyes, who became an investor in the team in 2001, said recently he is willing to sell a majority share in the franchise but would want to stay on as a minority shareholder. He said he expects to spend more time dealing with the team following the resignation of Coyotes CEO Jeff Shumway, who stepped down late last month to spend more time dealing with Moyes' other business interests. "I think the thing people shouldn't lose sight of is that Jerry Moyes has been committed to Glendale, he's been committed to the Coyotes," Bettman said. "We're not just talking about energy and passion, we're talking about a huge financial commitment. He's somebody who believes, as do I, that the future of the Coyotes is in Glendale." When asked for a time frame for resolving the Coyotes' situation, Bettman said he expects it to happen soon -- and that in the meantime, it's business as usual for the franchise's day-to-day operations. "We're working on bringing this to a conclusion by season's end," he said. "Business is being conducted as usual, and all the rumors about things that are going wrong are simply without merit. We're going to continue to make sure, as I'm sure Jerry and (team president) Doug Moss and (GM) Don Maloney and Wayne Gretzky are doing, that the team is going to continue to play. Things are going to continue to proceed, as they do for all of our clubs through the season, and we're going to spend the next couple of months trying to get our arms around these problems and solve them. "I think people, especially our fans in Arizona, shouldn't let these distractions affect the attention they pay to the good things that are going on on the ice." The commissioner also noted that in recent years, the League has successfully dealt with bankruptcies in Buffalo, Ottawa and Pittsburgh. "Despite some of the hysterical articles that are written in some quarters, and from places thousands of miles away from Arizona, the fact of the matter is that we have a pretty good track record, when franchises or franchise owners have problems, of solving them," he said. "With bankruptcies in Buffalo, Ottawa and Pittsburgh … we went about addressing the problems, and all three of the franchises are doing quite well now." He also noted that all three of those cities are "traditional" hockey markets, and said he has no doubt that the NHL can succeed in non-traditional markets such as Arizona. "I think all of this blanket categorization that 'hockey doesn't work in the Sun Belt' is complete hogwash," he said. "We have a lot of great fans throughout the Sun Belt. There are a lot of great fans in Arizona. With the job that Wayne is doing molding this young team, I think the Coyotes have a bright future on the ice, and I think fans are going to respond even increasingly to that." The Coyotes are in a scramble for the final playoff berths in the Western Conference as they try to snap a postseason drought that extends back to 2001. Coyotes captain Shane Doan noted recently that the lack of success on the ice was a significant contributing factor to the team's struggle to draw fans. "I think that's a fair point to make," he said when asked about Doan's statement. "When commentators point to markets where attendance is down, if you look at the long-term recent performance of those clubs, it's normally directly related to a team that's been struggling on the ice for a long period of time. "I think fans believe, particularly with the system we now have governing players' salaries, that all teams should be able to, at some point … be competitive. Fans demand that. I think as the Coyotes get increasingly competitive, which they are, the attendance will increase, which is what is what you're seeing this season. Attendance is up double digits for the Coyotes this year because fans are excited about what they're seeing."